What do we really know about H.H. Holmes, “America’s First Serial Killer?” How did the stories about him grow? Adam gives a gripping account of his career, with notes on how researchers separate fact from fiction. Perfect for classes who are reading Devil in the White City and plays to packed houses in libraries. There are lots of stories of Abraham Lincoln attending seances, predicting his own death, and haunting the White House. Where did these stories come from? An illustrated talk based on Adam’s Ghosts of Lincoln book. Adam has been running ghost tours and writing about local ghostlore for over a decade. His ghost presentation is perfect for October in libraries, and the historical angle makes it great for schools. Did you know Chicago was briefly THE place to be making movies in America? We were Hollywood before Hollywood existed! Adam’s new book on the subject, Flickering Empire, is earning rave reviews. In his talks, he discusses the history and shows a few rare, hilarious silent shorts from a century ago. Available solo or with his co-author, Michael Glover Smith. Email Adam for rates and info! 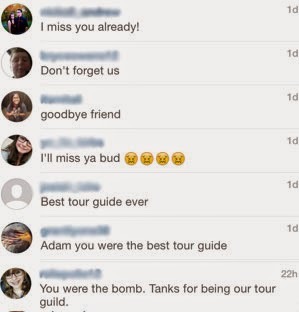 Sometimes students find Adam’s instagram. Note: Adam is also available as a tour director for school groups traveling with Brightspark Travel. Request him as a director and/or ask for one of his tours as part of your itinerary!